DOW Filmtec BW30HR-440 RO Membrane 12650 GPD, Wet, a 8" x 40" high rejection brackish water Reverse Osmosis Membrane that can provide RO quality water up to 12,650 gallons per day at a 15% recovery rate. It can operate at feed pressures ranging from 225 psi to 600 psi with 99.7% salt rejection. It has a 440 ft2 active area that delivers the highest quality permeate water while minimizing CAPEX and OPEX. This element offers the the most effective cleaning performance for large-scale industrial and municipal water treatment systems purifying greater than approximately 10 gpm (2300 L/h) of RO water and is the industry standard for reliable operation and production of RO water in commercial applications. These elements are ideal for reverse osmosis plant managers and operators dealing with controlled pre-treatment waters and seeking consistency, high performance, long element life, increase productivity, higher water quality coupled with excellent fouling resistance and reduced footprint installations. Filmtec elements can separate salts from water and are produced with an automated fabrication process for precision, consistency, and reliability offering high rejection of dissolved solids and organics and operate very efficiently at lower pressures. It delivers the most effective cleaning performance, robustness and durability due to its widest cleaning pH range(1–13) tolerance. The 440 square feet of active membrane area, gives system designers the option of designing a system with fewer membrane elements, requiring lower capital expenditures for membranes and components. This element is widely used in industrial water demineralization, production of municipal drinking water and water reuse. Recommendation: convert BW30-440 to BW30HR-440. 440 sq ft active area. 600 psi maximum operating pressure. Reduce wastewater volumes by increasing water reuse. High flux results in high yields. Low energy costs with high rejection providing good water quality. Hard shell exterior for extra strength. Durable with Good Cleanability for Long Element Life. 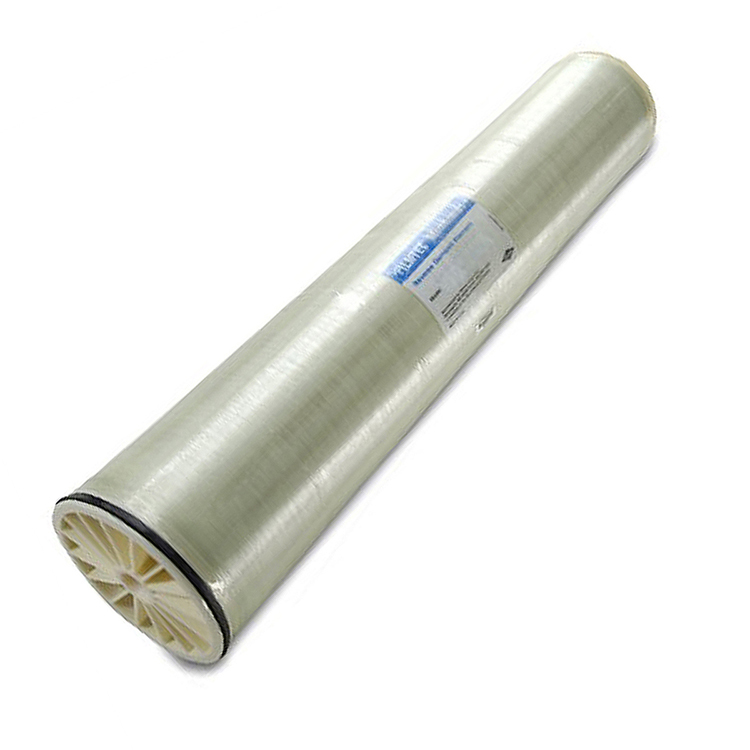 DOW FilmTec high quality, long lasting and reliable performance. * Permeate flow rate and salt rejection based on the following test conditions: 2,000 ppm NaCl, 125 psi (8.6 bar), 77°F(25°C), pH 8, 15% recovery. Permeate flow rates for individual elements may vary +/-15%. **** Active area guaranteed ±3%. Active area as stated by Dow Water & Process Solutions is not comparable to nominal membrane area often stated by some manufacturers. - Stabilized salt rejection is generally achieved within 24-48 hours of continuous use; depending upon feedwater characteristics and operating conditions.